You may feel like crap, but you didn't smoke and make it worse. That's a win for you! Not one puff ever. Nicodemon sticking out his ugly head you are 90+ days strong. NO MATTER WHAT! DO NOT SMOKE. Hang tough bsheats. If you have to go punch a pillow or yell into a paper bag. Stay close to the community. Hang in there. You’re doing great! It will get easier; even when your hubby is being a ******* *******. Easy does it. Keep growing your quit even when Ugly stuff comes up. Yes you can, one day at a time. Easy does it, smoking won't change what he is, It will only change what you are! BREATHE! Ride through the anger. I hope your evening is more peaceful! Nothing wrong with being angry! Vent away but make it a win-win. Vent and continue to be smoke free. It's ok to want, just don't act on that wanting. Replay the Relapse You've worked too hard to let this go because of a husband trigger. Stay the course. You'll be real happy you did, but real unhappy if you don't. And now you've got nice clean bathrooms to boot! Sounds like something to smile about to me. Sending a mind hug. I, too, am just reading this. Anger is a tough emotion and has taken more than one of my quits but now I KNOW it's okay to be angry. I do not have to push it down. I CAN be angry and nothing terrible will happen...nothing HAS. I am so sorry your husband is being a turd...I hope he doesn't get sick but if he does, you KNOW he is going to whine like a little girl. Just remember that and remember that you do NOT have to smoke, it will not help anything. IT'S OKAY TO BE MAD.. Okay.....I feel much better, how about you? I LOVE that. 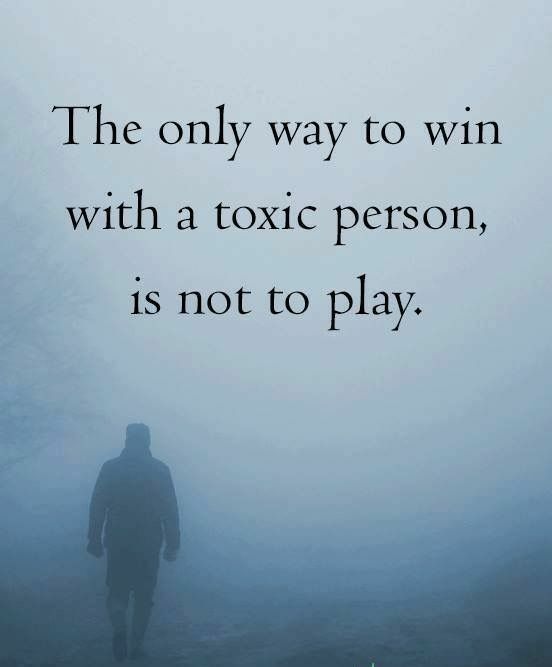 The only way to win with a toxic person is not to play. This is what I was searching for last night. And what I was doing by avoiding him. I made one mistake though. I let it affect me more than it affected him. That's the problem with anger. It's it hurts us more than the other person. I've known that for a long time, I was just too blinded by rage last night to think about it. Thank you so much! I disinfected both bathrooms, shook out the rugs, clean the toilets, straightened up. Now I'm crying. Well, I couldn't stop being angry. I stayed upstairs even through dinner which was breakfast for dinner and HE made it. I didn't know how to let go. It was a childish, childlike anger. Did you ever get so angry that you started thinking about how people would miss you if you died? Wow! I went the whole way. Started planning what I would write if I were to Die the next day. So not only a day but the whole evening was ruined. My stomach got emptier and emptier. I finally stole down later and grab some toast. Never let the sun set on your anger has always been my motto. So I casually came down before bed and said do you want to watch an episode of Father Brown? He said yes so we did. Then I said good night and went back upstairs. I didn't smoke! It wouldn't have helped anyway. I want to thank everyone who responded to my plea. I read each and every one of them several times. Thanks for getting me through. I love you all. P. S. It is the next day and I think I'm getting better. Coughing up more junk for my lungs but feeling like I want to get out and move and get rid of some stiffness. Time to go back to yoga! You did great!! Missed this blog last night. So happy you made it through it!! bsheats I remember when I was still smoking and stuffing and I would light up a cigarette and smoke it FURIOUSLY...puff, puff, puff, all the while envisioning the object of my anger incinerating. Or else I would do the I should have said thing...over and over as I puffed away. Guess what I got for that? You already know...the object of my anger was never impacted but my lungs certainly were. Thank you Ellen. And I know that. But it did not help me when I needed it. starting at the age of 15 means that I have stuffed a lot of feelings. Emotional immaturity. That's going to take some time to get better. bsheats That's why it is one day at a time...it's a long journey. There are times when I envision myself stomping my feet like a child having a tantrum...as I got older, those were the times when I lit up, after I quit, I had to learn new ways to deal with disappointment and grief and anger...ahhhh anger, such a powerful emotion and such a test over and over again but it IS getting better, just like "they" said it would.